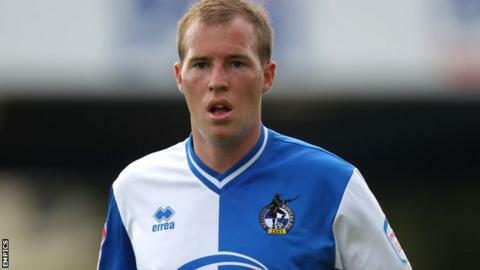 Striker David Clarkson "wants to be loved" at Bristol Rovers, according to manager Mark McGhee. Clarkson, 27, signed for the League Two club following his release from cross-city rivals Bristol City in the summer. The Scotsman has played in every game for Rovers so far this season and netted his first goal - a stunning 30-yard-strike - in their 2-2 draw with Aldershot on Saturday. "It was a statement from him," McGhee told BBC Radio Bristol. "He's deserved a goal and he's showed by his reaction that he's here, he's a Bristol Rovers player and wants to be loved." Clarkson spent three seasons with Bristol City but struggled to get a consistent run in the side, scoring only 11 goals in 67 appearances. Now he is off the mark for Rovers, McGhee thinks he will grow in confidence. "He has been excellent and I thought he was excellent again today [Saturday]. "I thought it was a terrific goal and I think he'll get many more for us." Rovers looked as if they were going to fall to their third league defeat of the campaign against the Shots until Fabian Broghammer grabbed a last-minute equaliser for the hosts. But despite the German winger's contribution, McGhee says he still has a lot to improve on. "He's quick and he can get in to these areas but also he's been a little bit ropey with his inconsistency and his discipline. "He's not a player I think is ready to start but it's important that when we put subs on they make a contribution. "I think the three subs that came on did that. It's important that I can look to the side of me and see people that can change the game."